This 4 bedroom house with swimming pool is located in Noto and sleeps 13 people. It has WiFi, parking nearby and air conditioning. The house is near a beach and within walking distance of a restaurant. 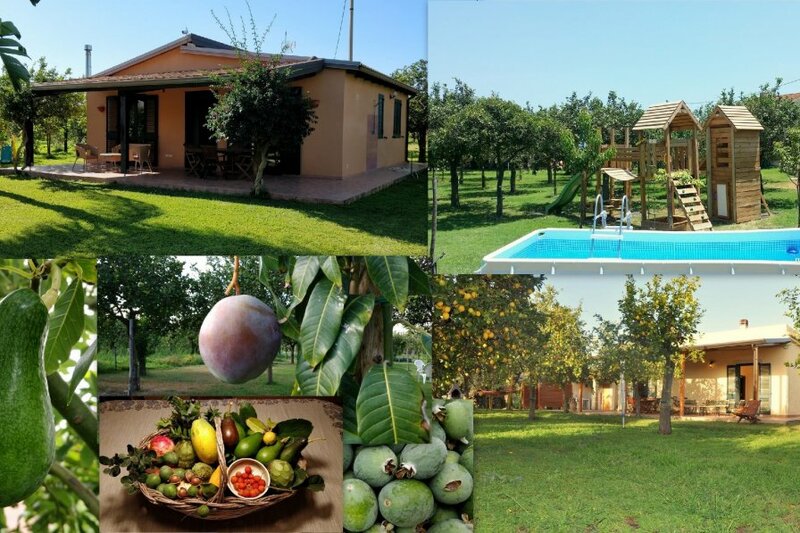 Eco-friendly accommodation, 13 sleeps, 2 buildings in the same Tropical Garden - 350 mt from the sea, 2 hectares lands with tropical fruits, lemons, vineyard, olive grove, Wi-fi and AC. Taste our honey, extra virgin olive oil, Nero d’Avola wine and fruits freely. Our accommodation is 350 mt away from sand beach, in Lido di Noto, called also Noto Marina. The accommodation is in a very quiet and wide garden. There are 20,000 sqm garden of lemon wood, tropical fruit trees, olives grove and vineyard. You can find a donkey and others small animals. Chicken eggs for our guests every day. Comfortable beds with slats and foam latex mattresses in every bedrooms. There are 2 barbecues, 2 satellite TV with international channel, 1 dishwasher, garden furnitures. Wood for the 2 stoves for the winter. Toys for children, slide, swing, playground, 2x4 mt swimming pool, 2 hammock, 2 Divx DVD player, 2 baby cot and 2 high chairs. A short trekking distance away, along the coast there is Vendicari natural oasis where bathing is allowed. heating and cooling with heat pump, storm windows, double glazing, 100% utilization of energy saving lamps, photovoltaic panels produce more than 100% of the energy absorbed by consumption, waste recycling, composter, burning of pruning of our trees as fuel for stove. During your stay you can harvest: bio lemons (all year around), oranges, grapes, pomegranates, grapefruits, white mulberries, kaki, plums, apricots. Some tropical fruits: bananas, feijoa, guava, white sapote, mango, avocado, macadamia, water berries. Vegetable: tomatoes, aubergines, peppers, lettuce, zucchini and more. We produce bio honey, extra virgin olive oil and “Nero D’Avola” wine. Airplane + car from Catania airport: follow the highway for Siracusa, Avola and Noto, take the exit "Noto", continue for Lido di Noto. We are 80 km away from Catania, free highway, 45 minutes away. Airplane + car from Comiso airport: We are 80 km away from Comiso.